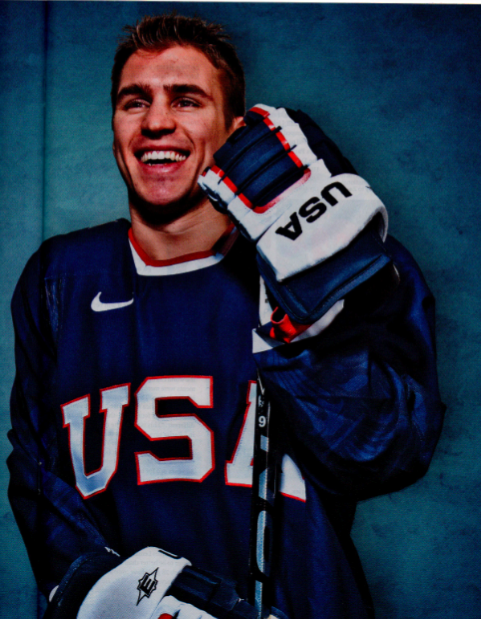 Say hello to Zach Parise, the best player in the NHL you don’t know. Remember his name, because he may write another golden chapter in the history of U.S. hockey. At mile marker 112.6, near Exit 16E, a hockey player looms over the mighty ribbon of the New Jersey Turnpike. You can’t miss him, even at 55 mph. “Score with reading,” Zach Parise, identified as NJ Library Champion, says on the billboard. 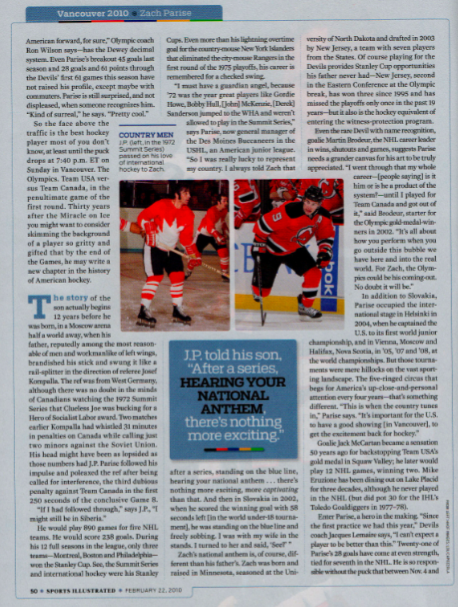 Even if no one speaks like that, it is worthwhile counsel for Garden State school kids, although the guess is Parise, decked out in his Devils red-and-black number 9, removes his helmet before cracking a copy of The Great Gatsby between shifts. Sidney Crosby promotes Reebok (where he has his own line of clothing), Gatorade, the Tim Hortons chain of coffee and doughnut shops and also stars in NHL television commercials. Alexander Ovechkin endorses CCM (where he has his own line of clothing) and a video game for 2K Sports, sang in a hilarious commercial for a Washington, D.C., area car dealership and is prominent in league commercials too. And counting the cars on the New Jersey Turnpike, Parise does a PSA for the state library system. So the face above the traffic is the best hockey player most of you don’t know, at least until the puck drops at 7:40 p.m. ET on Sunday in Vancouver. The Olympics. Team USA versus Team Canada, in the penultimate game of the first round. Thirty years after the Miracle on Ice you might want to consider skimming the background of a player so gritty and gifted that by the end of the Games, he may write a new chapter in the history of American hockey. The story of the son actually begins 12 years before he was born, in a Moscow arena half a world away, when his father, reputedly among the most reasonable of men and workmanlike of left wings, brandished his stick and swung it like a rail-splitter in the direction of referee Josef Kompalla. The ref was from West Germany, although there was no doubt in the minds of Canadians watching the 1972 Summit Series that Clueless Joe was bucking for a Hero of Socialist Labor award. Two matches earlier Kompalla had whistled 31 minutes in penalties on Canada while calling just two minors against the Soviet Union. His head might have been as lopsided as those numbers had J.P. Parise followed his impulse and poleaxed the ref after being called for interference, the third dubious penalty against Team Canada in the first 250 seconds of the conclusive Game 8. He would play 890 games for five NHL teams. He would score 238 goals. During his 12 full seasons in the league, only three teams—Montreal, Boston and Philadelphia—won the Stanley Cup. See, the Summit Series and international hockey were his Stanley Cups. Even more than his lightning overtime goal for the country-mouse New York Islanders that eliminated the city-mouse Rangers in the first round of the 1975 playoffs, his career is remembered for a checked swing. Zach’s national anthem is, of course, different than his father’s. Zach was born and raised in Minnesota, seasoned at the University of North Dakota and drafted in 2003 by New Jersey, a team with seven players from the States. Of course playing for the Devils provides Stanley Cup opportunities his father never had—New Jersey, second in the Eastern Conference at the Olympic break, has won three since 1995 and has missed the playoffs only once in the past 19 years—but it also is the hockey equivalent of entering the witness-protection program. Goalie Jack McCartan became a sensation 50 years ago for backstopping Team USA’s gold medal in Squaw Valley; he later would play 12 NHL games, winning two. Mike Eruzione has been dining out on Lake Placid for three decades, although he never played in the NHL (but did pot 30 for the IHL’s Toledo Goaldiggers in 1977–78). Enter Parise, a hero in the making. “Since the first practice we had this year,” Devils coach Jacques Lemaire says, “I can’t expect a player to be better than this.” Twenty-one of Parise’s 28 goals have come at even strength, tied for seventh in the NHL. He is so responsible without the puck that between Nov. 4 and Dec. 2 he was not on the ice for an opposing goal, a remarkable streak for a player who averages nearly 20 minutes. (He’s +24 for the season.) Although American fans instinctively gravitate to the goaltender—presumptive starter Ryan Miller has been the NHL’s best in the first half of the season—Team USA belongs to Parise. If this quick, small but determined group claws its way to a medal, the fulcrum will be the first-line left wing with a face on loan from a Giotto cherub. 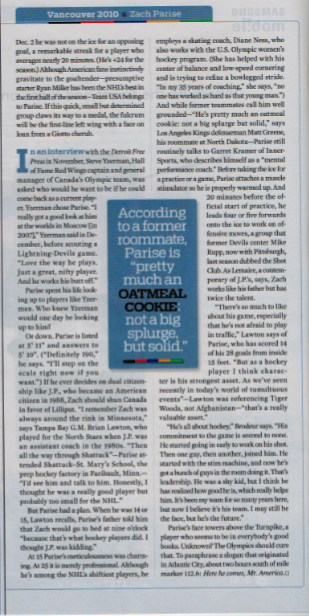 Parise spent his life looking up to players like Yzerman. Who knew Yzerman would one day be looking up to him? At 15 Parise’s meticulousness was charming. At 25 it is merely professional. Although he’s among the NHL’s shiftiest players, he employs a skating coach, Diane Ness, who also works with the U.S. Olympic women’s hockey program. (She has helped with his center of balance and low-speed cornering and is trying to refine a bowlegged stride. “In my 35 years of coaching,” she says, “no one has worked as hard as that young man.”) And while former teammates call him well grounded—”He’s pretty much an oatmeal cookie: not a big splurge but solid,” says Los Angeles Kings defenseman Matt Greene, his roommate at North Dakota—Parise still routinely talks to Garret Kramer of Inner-Sports, who describes himself as a “mental performance coach.” Before taking the ice for a practice or a game, Parise attaches a muscle stimulator so he is properly warmed up. And 20 minutes before the official start of practice, he leads four or five forwards onto the ice to work on offensive moves, a group that former Devils center Mike Rupp, now with Pittsburgh, last season dubbed the Shot Club. As Lemaire, a contemporary of J.P.’s, says, Zach works like his father but has twice the talent. Parise’s face towers above the Turnpike, a player who seems to be in everybody’s good books. Unknown? The Olympics should cure that. To paraphrase a slogan that originated in Atlantic City, about two hours south of mile marker 112.6: Here he comes, Mr. America. This entry was posted on March 20, 2010 at 2:19 PM	and is filed under Game Recaps. 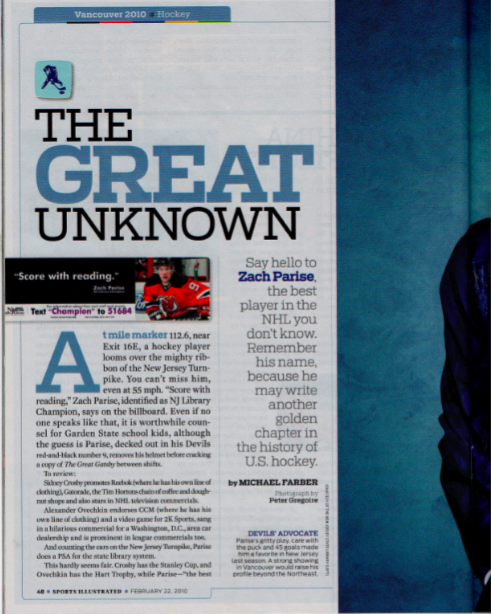 Tagged: Sports Illustrated, Zach Parise. You can follow any responses to this entry through the RSS 2.0 feed. You can leave a response, or trackback from your own site.